Born in 1925 in Nanjing, China, Macklin Hancock worked for most of his life at Woodland Nurseries in the city of Mississauga, Ontario. He was a Second World War veteran who flew Spitfires and kept an illustration of the famous plane in his home. After graduating from the University of Toronto with an agriculture degree (Ontario Agricultural College, now University of Guelph) he studied planning and landscape architecture under Dr. Walter Gropius, Lord Holford, and Dr. C. Holmes Perkins at Harvard University. 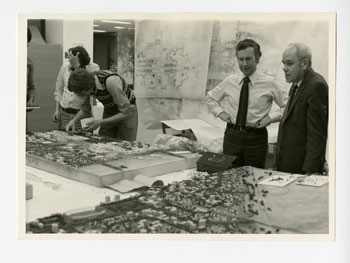 Hancock's first major project led to international recognition as a landscape architect and town planner: beginning in 1953, he was a member of the team that designed the new community of Don Mills. Following his initial success, he became one of the founding members of Project Planning Associates Limited, Toronto, which he was President of for more than forty-five years. He structured Project Planning Associates Limited as a multidisciplinary organization to provide fully integrated consulting services. For many decades, the company's project teams included planners and designers, infrastructure and transportation engineers, landscape architects, and environmental and socio­economic specialists. During his career, Macklin Hancock served as President of the Ontario Association of Landscape Architects and Canadian Institute of Planners. He also received many honours, including a Centennial Medal for Distinguished Service to Canada in 1967 and the Order of Ontario in 2003. His work on projects spans four decades as a planner and designer of developments in Toronto, Bahamas, Kuwait, Pakistan, Australia, China, and many other countries. These projects have included new towns and capital cities, business parks, retail and mixed-use centres, major parks, university campuses and tourist resorts. City of Xi’an. China. Satellite City , 2002-2004. Macklin Hancock died in 2010. In 2006, the library began receiving architectural records and further accruals are expected. Some of the Macklin L. Hancock - Project Planning Associates fonds has been catalogued in the University of Guelph Library's electronic catalogue, PRIMO. The holdings can be viewed in brief and full descriptions. Full records include project names and dates, format and quantity of materials, clients and related persons, and a brief description of the contents of files along with the library's call number indicating the location of the records. File lists of the materials received since 2010 are available for review on-site or by request.